Stormbaan Coureur is the Linux game that was formerly known as Sturmbahnfahrer. It is back with a larger track, more challenges, many improvements in a PC (Politically Correct) edition. In this game, it is all about the car Physics. If you want to master it, try to have the laws of physics work with you, not against you. Stormbaan Coureur, the linux game, is Open Source software which can be downloaded here. Enabling technologies behind Stormbaan Coureur include the Open Dynamics Engine and the portable game library known as PLIB. See the changelog for info on the latest edition. If you want to discuss this game, feel free to do so at the linux game tome forum. I hope to port this to my PS/3 some day. Sturmbahnfahrer sparked a derived application: a crashtest simulator for educational purposes. Stormbaan Coureur is a game by Bram Stolk. The name Stormbaan Coureur is Dutch for "Assault Course Driver". It's former name was Sturmbahnfahrer, which was my attempt on a German pun. The pun failed on two notes. First, it turned out that Sturmbahn is not a German word. The WWII rank refered to a Bann, not a Bahn. Second, the bad taste pun turned out to be more offensive than intended. Many have voiced concerns about the bad taste, so from version 1.5 onwards it has a new name. NEWS FLASH: Version 2.1.6 has been released. NEWS FLASH: Now available: Stormbaan Coureur 1.5 dubbed the PC edition! New name, better action, more challenges. NEWS FLASH: Now available: Sturmbahnfahrer 1.3 dubbed the VR edition! This edition has support for quad buffer stereo and passive stereo setups. See also Bram's latest game, currently under development. The code name is howitzer simulation, and this game is being published under the ransom model. With enough pledges, the game will be released as GPLV3 software. To see the technology demonstrator, click on the youtube video. Key element in this howitzer simulation, is the highly accurate simulation of the tracks. 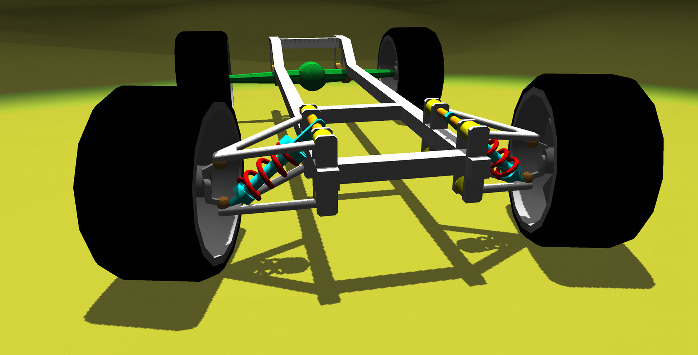 In the physics simulation, a motor drives the sprocket, which in turn collides with all the links in the track. Each link in the tracks, is a fully simulated rigid body. If you want the game, including full source code, released, please send in your pledge.